It’s Veterans Day every day in Beaumont, where a memorial that never closes gives residents a chance to honor and remember those who served their country in the armed forces. The Beaumont Veterans Memorial was dedicated during a ceremony on Veterans Day in 2002 by the Beaumont Veterans of Foreign War Post 233. Located in front of the Civic Center at 550 E. Sixth Street, the memorial honors deceased Beaumont citizens who lived in Beaumont and served in a branch of the U.S. military or in the Allied Armed Forces. The memorial, in a rose garden setting, salutes veterans who have served starting in World War I and continuing through today's Operation Enduring Freedom in Afghanistan. It consists of three granite slabs where hundreds of names of local veterans are listed, including their rank and military branch. There are also four memorial benches and five granite plaques that honor the seal and motto of the Air Force, Army, Coast Guard, Marine Corps, and Navy. The Beaumont Veterans Memorial honors deceased military personnel who lived in Beaumont or Cherry Valley while on active duty or who died later in those communities after their military service ended. As a city, Beaumont respects the enormous sacrifices made by those serving in our armed forces. It is with pride that we inscribe on the memorial for families the name, rank, and military branch of their loved one. Applications: Applications are available at the Albert A. Chatigny Senior Community Center located at 1310 Oak Valley Parkway or, you may submit an online application.Please note engraving of names is pending Memorial expansion. 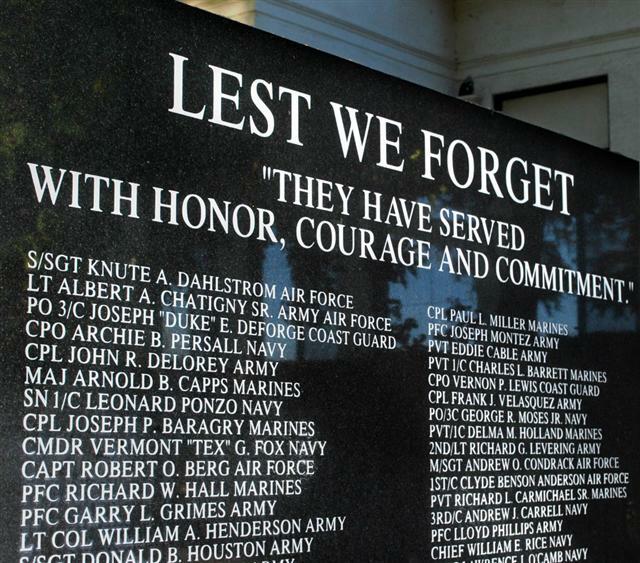 Unveiling of the names: A ceremony is held annually on Memorial Day at 11 a.m. in front of the Beaumont Civic Center. Honoree families will be notified by mail and will receive a white carnation as their loved one’s name is called. Additional information: For more information and application deadlines, please contact the Community Services Department at 951-769-8524.